While joining a local gym can help you achieve your weight loss goals and stay in shape, it tends to be expensive in the long run. The best home gyms are designed for multi-exercise routines in the comfort of your home. While they might seem expensive, you will only have to make a one-time payment. Besides, you can use them together with other family members. Other advantages of these gyms are; you will avoid a lot of traveling, waiting in line for your time, and ensure that you do your exercise in a hygienic environment. Besides, you can work out anytime without compromising your work/school schedule. There are various brands and models of home gyms available. In this guide, we have reviewed the top ten models that are currently in the market. By choosing any of the below models you can kick-start your journey to weight loss and maximum fitness. Read more about the gymnastics mats. With Marcy Multifunction home Gym, you can enjoy a complete body workout without leaving the sweet comforts of your home. We love its innovative design that is full of features that assist you in sculpting the body to the shape you have always wanted. It is crafted from heavy-duty 14 gauge steel frame to ensure strength and durability you can rely on. While it is not assembled when it arrives, it comes with simple assembly instructions and all the required hardware. This is another high-end home gym from Marcy. 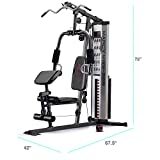 This model comes with a club machine allowing you to get total body training. Similar to other products from this manufacturer, this unit comes with sturdy yet lightweight construction to enhance your convenience. 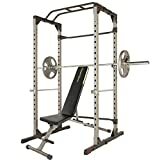 Additionally, this model combines three types of strength building machine, allowing you perform more than a hundred club quality exercises. 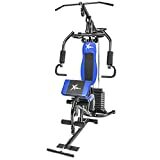 Boasting of over sixty gym-quality exercises that work on your muscles to sculpt your body, you will find this home gym from Bowflex useful. This unit comes with an impressive 210lbs of power rod resistance that allows you to not only maximize your strength training but also reach your fitness goals. Besides this model comes with a sliding seat rail that allows you to perform leg presses and aerobic rowing. Bowflex PR1000 is a powerful home gym designed to strengthen your muscles and perform cardio exercises to improve your fitness levels. 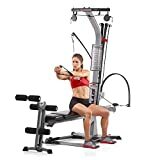 This home gym offers the user with 210 pounds of power road resistance that ensures that you can exercise your abs, chest, core, arms, back, shoulders, as well as lower body. 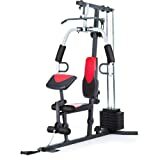 Some of the other features that make this unit stand out include the sliding seat rail, workout placard, cushioned rollers that work n your legs, triple function hand grips that allow you complete pulldowns as well as a horizontal bench press. The Weider Ultimate Body Works is designed to allow the user experience a comprehensive total body workout. This is a powerhouse home gym that allows you perform more than fifty different body-shaping exercises. The model comes with adjustable features and multiple accessories that ensure a complete workout. For extra resistance, this unit comes with a cable pulley system and four power bands. Sculpt your body and strengthen your muscles with this home gym from Weider. Featuring six muscle sculpting workout stations, you don’t need to pay gym membership fees since you have everything you need. Unlike other models, this unit comes with a higher pulley, chest fly, preacher curl, Leg developer, low pulley station as well chest press. What’s more, you are also provided with an exercise chart that allows you to get an effective workout. You can say goodbye to costly gym fees and hassles of traveling to a local gym after work every day by purchasing this home fitness station. This unit will allow you to enjoy a full body workout from your home’s comfort. Featuring a variety of options, it is possible to work on every group of muscles and achieve the body shape that you have always loved. With over thirty strength-training exercises, this home gym from Marcy will help you burn the calories fast and strengthen your muscles. This model comes with dual functioning press arms that allow for Pec fly and chest press exercises. It also comes with a dual function leg develop that ensures proper knee alignment for effective leg curls and leg extensions. Besides, this home gym also comes with innovative multi-position low and high pulleys that ensure a smooth resistance to full body exercises. 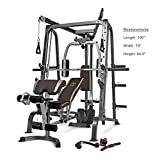 This home gym combines two effective body workout equipment including a power cage and twelve-position weight bench to ensure the best performance. Besides helping you save money on gym membership, this unit provides you with the versatility of exercising in your home. The cage features two locks on safety and two chrome dual mounted bar to ensure your safety. The unit also comes with an impressive weight capacity of 800lbs and 19 height adjustable height levels. The multifunction, user-friendly, and innovative Powerline home gym comes with a cleaver design that offers an exceptional range of motion and free-range movements. This makes it an exceptional choice for all users. This model also combines an ergonomically designed press arm and a functional training arm to ensure the user gets full body exercises. This helps the user reach their body sculpturing and weight loss goal fast.